Home » Mattress Comparisons » Sleep Number c2 vs c4: What’s Best for You? Sleep Number c2 vs c4: What’s Best for You? The Sleep Number c2 and c4 beds are both part of the original Sleep Number family. They’re part of the “Classic Series,” meaning they come with fewer bells and whistles than other Sleep Number models. However, they still provide adjustable support and will be more affordable than the more luxurious Sleep Number options. Before we discuss the key similarities and differences, let’s get you up to speed with what makes Sleep Number a unique mattress company. For starters, Every Sleep Number bed is really an air bed that’s completely adjustable with the click of a button. Each mattress comes with a remote so you can adjust the amount of air in the air chamber and find the perfect “Sleep Number,” and firmness, for you. Additionally, each side of a Sleep Number bed is adjustable, making this a nice option for couples who don’t want to compromise on how soft or firm their bed feels. They’re adjustable. This holds true for all Sleep Number beds, but we can’t <inotmention it. The main feature that ties all the different Sleep Number models together is the fact the air in each mattress can be inflated or deflated instantly to adjust the amount of pressure in the bed and therefore make the bed feel softer or more firm. The exact level of comfort you find will come with a Sleep Number setting, a number between 1-100. They’re firm. 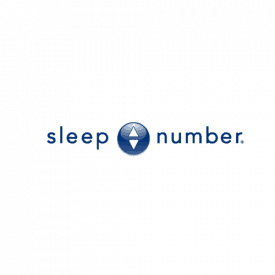 Sleep Number model numbers range from 2 to 10, and will indicate how soft or hard your bed will feel. Naturally, the c2 and c4 naming indicates these beds will be on the firm side; this is because they either offer very little or no comfort foam layer above the air chamber. (More on this key difference in the next section!) However, even though one offers a bit more material than the other, both of these beds will feel very firm, making them good options for back sleepers. They’re in the Classic Series. These two beds are the only non-smart bed option to choose from. All of the other Sleep Number beds are part of the 360° Smart series, meaning they’ll have certain features like an auto-adjustable mattress that tracks and responds to your natural movements throughout the night. However, a benefit to the Classic series is these beds are far less expensive and are less susceptible to tech repairs given there are fewer features. You get the same warranty. Both beds come with a 25 Year Limited Warranty. The fine print says that Sleep Number will repair or replace your bed if there’s a defect that isn’t caused human error for the first two years. From year 3-25 of the limited warranty, you will become responsible to pay for a portion of the repair and replacement cost. Sleep Number calculates the exact amount based on the “then-current” prices of each product. It’s not a simple calculation, given Sleep Number is often changing their prices throughout the years. You can integrate your bed with Sleep IQ. For an extra $150, you can add-on Sleep IQ integration, which records and monitors your sleep activity so you have access to a comprehensive review of your sleeping habits every morning. Both of these beds are the only models where you have to pay for this feature; all other models include this integration. Here are the key differences between the Sleep Number c2 and Sleep Number c4. These points might really help you figure out which bed might be a better fit for you. The C4 has a bit more padding. The c2 model is the only bed that doesn’t have any comfort foam layer above the airbed. Instead, there is a soft fiberfill sewn into a thin layer right above the air chambers. The c4 has a foam comfort layer that is 1.5 inches thick. It’s made of polyurethane foam that features three “zones of comfort,” designed to provide pressure relief for the head and neck, back, and hips. Mattress profile. 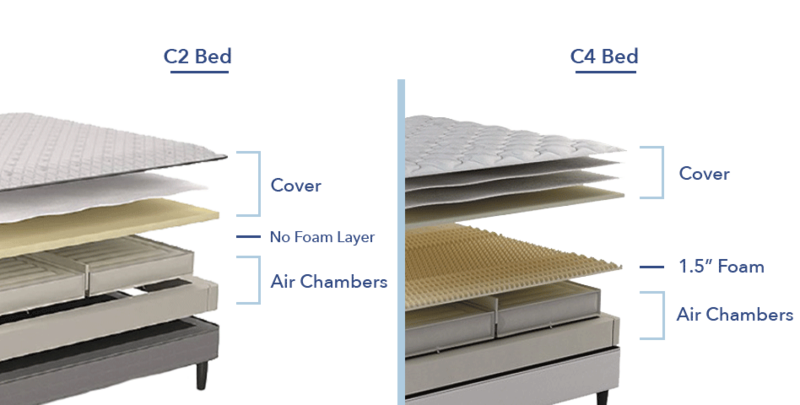 The c2 bed mattress profile comes in at 8 inches, while the c4 bed is 10”. The profile is measured from the base to the top of the mattress. The c2 and c4 beds vary quite differently in price. Here’s a chart that differentiates the price. These beds will feel similar, but the c4 model has the 1.5 inches of comfort foam, so will naturally feel a little softer. This comfort layer is designed to contour and support your head, neck, and back, so if you specifically need extra support in those areas, you might get more plush support from the c4. Based on customer reviews, many commented on the soft mattress cover of the c4 model as well. That said, the firmness of any Sleep Number bed is also controlled by the air chambers themselves and what your Sleep Number is. Said otherwise: Both beds will feel firm and sturdy. With there being a $700 difference between both beds, you’ll need to really evaluate how much the comfort layer is worth. You want the cheapest option. This bed is far more affordable than other beds. Many people complain that Sleep Number is too pricey since these beds are also susceptible to tech issues and breakdowns. If you’re on a budget but know you want a Sleep Number bed, the c2 will give you the adjustable mattress and a fair price point. You want the extra layer of comfort. Many reviewers said the comfort layer was indeed comfy, saying the plush and contouring qualities complimented the firm bed. Sometimes a little extra bit of foam can go a long way! You’re on the heavier side. According to Sleep Number, their mattresses can hold up to 400 lbs of weight per side. However, since the c4 has a bit more cushion and one extra layer, it will do a better job of supporting people who are on the heavier side. If you know you want a firm bed that adjusts to your exact firmness level, you can’t go wrong with either the Sleep Number c2 or c4. That said, these subtle differences might mean a lot to your sleep style, so pay close attention to what you really need when deciding which bed to choose.